Place the hammer to the half-cocked position and remove the percussion cylinder. Insert the .22 Rimfire Barrel Adapter into the breech of the revolver barrel. Load the Cylinder with 5 cartridges, place the Konverter™ Ring on the Cylinder and carefully install the Konverter™ assembly in the revolver with the firing pin at the 12 o'clock position, inline with the hammer nose. Align the empty chamber under the hammer and carefully let the hammer down on the empty (safety) chamber. Always carry the revolver with the hammer down on an empty chamber. Minor fitting may be needed, detailed instructions included with each kit. This "Gated" Stainless Steel conversion cylinder will convert your 1858 Remington Pietta to .45 Long Colt. Please click on the "More Info" button for additional information and to read the Caution Statement provided by the manufacturer. This "Gated" conversion cylinders will convert your 1858 Remington Pietta to .45 Long Colt. Please click on the "Full Description" button for additional information and to read the Caution Statement provided by the manufacturer. The 1858 Remington Buffalo .44cal, Steel Frame revolver with the 12" Oct. Barrel is one of the strongest, most accurate, and most sought after black powder revolvers. See " More Info" for details. This revolver cylinder holster/pouch is made of top grain leather and built to last. 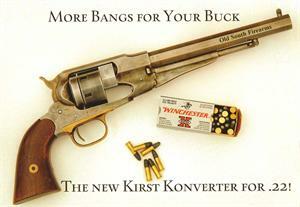 It is a convenient way to carry your extra conversion or black powder cylinder for ready access. Designed to compliment our Civil War holsters. See " More Info"
Oklahoma Leather Cartridge Belt, Deluxe .22cal. Loops, medium Oiled Brown, 34 to "39"
1858 Army - Walnut/Brass .44 cal., has a 8" octagonal blued barrel, brass frame, brass guard, and walnut grip. It is .44 caliber and has top strap/post sights. It is 13.5" in length weighs about 2.75 lbs. 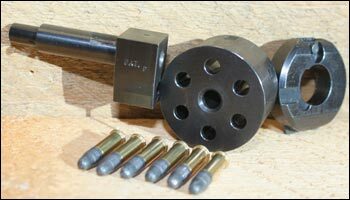 This conversion cylinder assembly will convert your 1858 Remington Pietta steel or brass .44 cap and ball revolver to fire .22 cartridges. Please click on the "Full Description" button for additional information and read the Caution Statements. This is the "Pale Rider" style Conversion Cylinder Assembly, it will convert your 1858 Remington Pietta to .45 LC. Please click on the "Full Description" button for additional information and to read the "Caution" Statement provided by the manufacturer. This is the "Pale Rider" style Conversion Cylinder Assembly, it will convert your 1858 Remington Pietta to .45 ACP. Please click on the "Full Description" button for additional information and to read the "Caution" Statement provided by the manufacturer. 1858 Remington, .44cal, Steel Frame, 8" Oct. Barrel. One of the strongest and most sought after revolvers. We have .45 Long Colt & .45 ACP Conversion Cylinders and Ejectors available for this gun, check them out on our "Shop by Catagory" pages. Designed to be the future of revolvers, the top strap, full frame design made this revolver one of the strongest available. 5-1/2" Barrel, Steel Frame. Shoots .44 Caliber round ball and can be converted to .45ACP and/or .45LC. This "Gated" conversion cylinders will convert your 1858 Remington Pietta to .45 ACP. Please click on the "Full Description" button for additional information and to read the Caution Statement provided by the manufacturer.